You'll finish with an optional ride to the 46th floor of Place Ville Marie to Le Sommet Observation deck where you will get an unparalleled view of the city. Montreal is home to the world’s longest underground tunnel network, spanning an impressive 33 kilometres (20.5 miles), and in this tour a specially chosen a 3km (2 mile) zig-zagging route of the most interesting parts is for you to explore. 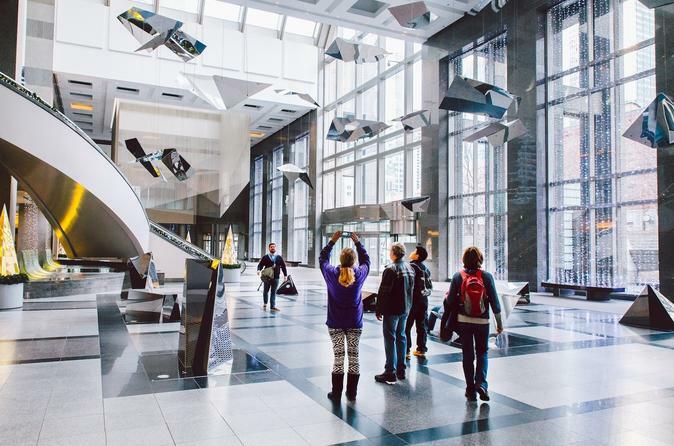 An expert guide will lead you on an urban hike through Montreal’s “RESO” system of interior spaces and underground tunnels that link the metro stations, public spaces, office buildings, boutique hotels, and art centers of Downtown and Old Montreal. You’ll hike through the tunnels, emerge to beautiful atrium views, admire (or critique) public art, pass an ice-skating rink the middle of a food court, ride the Metro and even discover how a mall was constructed underneath a Church placed upon stilts. Along the way you’ll learn why this network is so vital to Montreal’s economy. You’ll also find out the inside scoop on where to shop, dine, and explore, and you'll pause for a coffee along the way. The tour ends with an unparalleled view of Montreal at the Au Sommet Place Ville Marie Observation Deck where you'll ride the elevator up to the 46th floor. You'll observe the St-Lawrence River, Mount Royal, Old Montreal, Quartier des spectacles, and the Olympic Stadium tower, to name a few, and your guide will be right there with you to point out the most interesting sights and neighbourhoods. * Please note that the Sommet Place Ville-Marie portion of the tour is optional and that the pass to the summit is not included in the price of the tour. A pass can be purchased on the tour for an additional 21.85CAD$.